Ask The Bellwether: Do I move to a higher or a lower ratio to ply? Do I move to a higher or a lower ratio to ply? First, let's talk about twist: for a balanced two-ply yarn, you start with two singles each with the same amount of twist (generally Z, clockwise twist), and you ply them together with 2/3 the singles twist in the opposite direction (generally S, counter-clockwise twist). This takes 2/3 the twist out of each, so in the end, each single twists 1/3 Z (assuming Z singles), to the ply's 2/3 S twist -- a balanced yarn. The fibers will show you they are balanced by being parallel to the surface direction of the yarn, lining up like this ==== despite the S twist in the yarn plies. \=\=\=\= would be a typographical representation in this camera-shy article. Now, how do you measure twist? When you are comparing singles to ply, it's handy to look at the twists per inch (TPI). You can determine the singles TPI by letting a freshly spun length self-ply back on itself and counting the number of complete twists (half the # of bumps) in an inch. This is the TPI of the 2-ply, which in a balanced 2-ply such as this, is 2/3 the TPI of the original, un-plied singles. So a TPI of 6 in the 2-ply test means the unplied singles are 9 TPI. When you are walking up to some random yarn, however, it's handy to look at the twist angle -- the angle at which the ply puts the yarn strands. It takes about a 15 degree angle to make roving into yarn generally speaking; and 20 degrees is a nice soft knitting yarn. Most sock yarns are about 30-35 degree angle of twist, and weaving yarns can have an even higher twist angle. If you want to measure twist angle, here's a handy-dandy online angle-gauge you can print and laminate from the Memphis Spinning on the River Fiber Guild. One interesting mind-bender is this: at the same twist angle, a finer yarn will have a higher twists-per-inch than a thicker yarn. A picture would make that crystal clear! And while I'm on this twist tangent, let me point you to the Spring 2008 Spin-Off and Abby Franquemont's most excellent article on twist and plying. But, back to plying on your wheel ... do you move to a higher or a lower ratio to ply? There are two considerations here ... first, since you are generally putting in less twist when you ply than when you spin the singles, you might think, that you would move to a lower ratio. On the other hand, when you ply, you are dealing with two very well prepared singles -- you won't be drafting things out, measuring thickness, or generally fussing with the fiber any longer; so there is less work to be done. Most folks who have been spinning for a while, then, ply at a higher ratio than they spin singles, and rocket through it fairly quickly. Moving to a higher ratio also helps you get enough twist into your ply -- spinners (I raise my own hand to admit this) tend to underestimate the amount of plying twist needed, and end up with underplied yarns. Now, if you have a default speed of your feet generally, you may find staying at the same ratio gives you a nicely balanced yarn; or possibly even lowering your ratio. In truth, I hear you -- "she's waffling" you say -- but honestly, there are no hard-and-fast rules here. Try what works for Abby (she moves from rocket ship for her singles to light speed for her plying); ply your skein, wash it, and see if the skein is overplied or underplied. If it's overplied, then try staying at the same ratio when you ply; if it's waaay overplied, try stepping down a ratio on your wheel. If it's underplied, move up and treadle faster. If your wheel has only one ratio, what can you do? Basically, you need to determine how much twist is needed to ply, and how much effort is required to get that twist in there -- draft out a length of your two singles and then treadle until the fibers within them line up parallel (for a balanced yarn). Get into a rhythm of drafting and treadling to get the yarn you want, and repeat that rhythm for each length you ply. Why does my yarn drift apart when I'm plying? How do I use the ratio on my spinning wheel? How can I fix my 2-ply yarn? 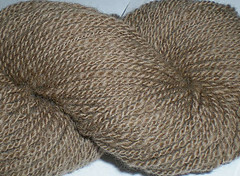 How do you make a good-looking two-ply yarn? Did this bring to mind more questions on plying? Let me know, I'll add them to the list. Next up ... How do I spin thicker plied yarns? See the whole blog at http://askthebellwether.blogspot.com/ ... and stop by the shop for lovely fibers, at http://www.thebellwether.com/. Question from my part, with regard to plying: how do I rescue overplied yarn? Say, I've plied a nice 3-ply and it felt great while doing so, but even after washing it twists in itself like a hungry snake... what to do? And yes, you can take out the overplying; take out some of the twist by running the plied yarn through your wheel while turning the wheel in the other direction.